It is the last enzyme in the respiratory electron transport chain of cells located in the membrane. It receives an electron from each of four cytochrome c molecules, and transfers them to one dioxygen molecule, converting the molecular oxygen to two molecules of water. In this process it binds four protons from the inner aqueous phase to make two water molecules, and translocates another four protons across the membrane, increasing the transmembrane difference of proton electrochemical potential which the ATP synthase then uses to synthesize ATP. Hemes and cofactors are inserted into subunits I & II. The two heme molecules reside in subunit I, helping with transport to subunit II where two copper molecules aid with the continued transfer of electrons. Subunits I and IV initiate assembly. Different subunits may associate to form sub-complex intermediates that later bind to other subunits to form the COX complex. In post-assembly modifications, COX will form a homodimer. This is required for activity. Both dimers are connected by a cardiolipin molecule, which has been found to play a key role in stabilization of the holoenzyme complex. The dissociation of subunits VIIa and III in conjunction with the removal of cardiolipin results in total loss of enzyme activity. Subunits encoded in the nuclear genome are known to play a role in enzyme dimerization and stability. Mutations to these subunits eliminate COX function. Cyanide, azide, and carbon monoxide all bind to cytochrome c oxidase, inhibiting the protein from functioning and leading to the chemical asphyxiation of cells. Higher concentrations of molecular oxygen are needed to compensate for increasing inhibitor concentrations, leading to an overall reduction in metabolic activity in the cell in the presence of an inhibitor. Other ligands, such as nitric oxide and hydrogen sulfide, can also inhibit COX by binding to regulatory sites on the enzyme, reducing the rate of cellular respiration. Cyanide is a non-competitive inhibitor for COX, binding with high affinity to the partially-reduced state of the enzyme and hindering further reduction of the enzyme. In the pulsed state, cyanide binds slowly, but with high affinity. The ligand is posited to electrostatically stabilize both metals at once by positioning itself between them. A high nitric oxide concentration, such as one added exogenously to the enzyme, reverses cyanide inhibition of COX. 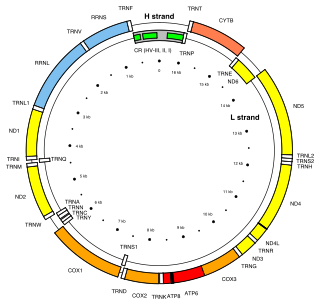 Location of the 3 cytochrome c oxidase subunit genes in the human mitochondrial genome: COXI, COXII, and COXIII (orange boxes). Cytochrome c oxidase has 3 subunits which are encoded by mitochondrial DNA (cytochrome c oxidase subunit I, subunit II, and subunit III). Of these 3 subunits encoded by mitochondrial DNA, two have been identified in extramitochondrial locations. In pancreatic acinar tissue, these subunits were found in zymogen granules. Additionally, in the anterior pituitary, relatively high amounts of these subunits were found in growth hormone secretory granules. The extramitochondrial function of these cytochrome c oxidase subunits has not yet been characterized. Besides cytochrome c oxidase subunits, extramitochondrial localization has also been observed for large numbers of other mitochondrial proteins. This raises the possibility about existence of yet unidentified specific mechanisms for protein translocation from mitochondria to other cellular destinations. The increased reliance of neurons on oxidative phosphorylation for energy facilitates the use of COX histochemistry in mapping regional brain metabolism in animals, since it establishes a direct and positive correlation between enzyme activity and neuronal activity. This can be seen in the correlation between COX enzyme amount and activity, which indicates the regulation of COX at the level of gene expression. COX distribution is inconsistent across different regions of the animal brain, but its pattern of its distribution is consistent across animals. This pattern has been observed in the monkey, mouse, and calf brain. One isozyme of COX has been consistently detected in histochemical analysis of the brain. ^ Castresana J, Lübben M, Saraste M, Higgins DG (June 1994). "Evolution of cytochrome oxidase, an enzyme older than atmospheric oxygen" (PDF). The EMBO Journal. 13 (11): 2516–25. PMC 395125. PMID 8013452. ^ Balsa E, Marco R, Perales-Clemente E, Szklarczyk R, Calvo E, Landázuri MO, Enríquez JA (September 2012). "NDUFA4 is a subunit of complex IV of the mammalian electron transport chain". Cell Metabolism. 16 (3): 378–86. doi:10.1016/j.cmet.2012.07.015. PMID 22902835. ^ Tsukihara T, Aoyama H, Yamashita E, Tomizaki T, Yamaguchi H, Shinzawa-Itoh K, Nakashima R, Yaono R, Yoshikawa S (August 1995). "Structures of metal sites of oxidized bovine heart cytochrome c oxidase at 2.8 A". Science. 269 (5227): 1069–74. Bibcode:1995Sci...269.1069T. doi:10.1126/science.7652554. PMID 7652554. ^ a b Voet D, Voet JG (2011). Biochemistry (4th ed.). Hoboken, NJ: John Wiley & Sons. ISBN 978-0-470-57095-1. ^ Zhang Z, Huang L, Shulmeister VM, Chi YI, Kim KK, Hung LW, Crofts AR, Berry EA, Kim SH (April 1998). "Electron transfer by domain movement in cytochrome bc1". Nature. 392 (6677): 677–84. Bibcode:1998Natur.392..677Z. doi:10.1038/33612. PMID 9565029. ^ Kaila VR, Oksanen E, Goldman A, Bloch DA, Verkhovsky MI, Sundholm D, Wikström M (July 2011). "A combined quantum chemical and crystallographic study on the oxidized binuclear center of cytochrome c oxidase". Biochimica et Biophysica Acta. 1807 (7): 769–78. doi:10.1016/j.bbabio.2010.12.016. PMID 21211513. ^ Szklarczyk R, Wanschers BF, Cuypers TD, Esseling JJ, Riemersma M, van den Brand MA, Gloerich J, Lasonder E, van den Heuvel LP, Nijtmans LG, Huynen MA (February 2012). "Iterative orthology prediction uncovers new mitochondrial proteins and identifies C12orf62 as the human ortholog of COX14, a protein involved in the assembly of cytochrome c oxidase". Genome Biology. 13 (2): R12. doi:10.1186/gb-2012-13-2-r12. PMC 3334569. PMID 22356826. ^ Mick DU, Dennerlein S, Wiese H, Reinhold R, Pacheu-Grau D, Lorenzi I, Sasarman F, Weraarpachai W, Shoubridge EA, Warscheid B, Rehling P (December 2012). "MITRAC links mitochondrial protein translocation to respiratory-chain assembly and translational regulation". Cell. 151 (7): 1528–41. doi:10.1016/j.cell.2012.11.053. PMID 23260140. ^ Kozjak-Pavlovic V, Prell F, Thiede B, Götz M, Wosiek D, Ott C, Rudel T (February 2014). "C1orf163/RESA1 is a novel mitochondrial intermembrane space protein connected to respiratory chain assembly". Journal of Molecular Biology. 426 (4): 908–20. doi:10.1016/j.jmb.2013.12.001. PMID 24333015. ^ Gaisne M, Bonnefoy N (September 2006). "The COX18 gene, involved in mitochondrial biogenesis, is functionally conserved and tightly regulated in humans and fission yeast". FEMS Yeast Research. 6 (6): 869–82. doi:10.1111/j.1567-1364.2006.00083.x. PMID 16911509. ^ a b c d e Fontanesi F, Soto IC, Horn D, Barrientos A (December 2006). "Assembly of mitochondrial cytochrome c-oxidase, a complicated and highly regulated cellular process". American Journal of Physiology. Cell Physiology. 291 (6): C1129–47. doi:10.1152/ajpcell.00233.2006. PMID 16760263. ^ Crofts A (1996). "Cytochrome oxidase: Complex IV". University of Illinois at Urbana-Champaign. ^ Khalimonchuk O, Rödel G (December 2005). "Biogenesis of cytochrome c oxidase". Mitochondrion. 5 (6): 363–88. doi:10.1016/j.mito.2005.08.002. PMID 16199211. ^ a b Sedlák E, Robinson NC (September 2015). "Destabilization of the Quaternary Structure of Bovine Heart Cytochrome c Oxidase upon Removal of Tightly Bound Cardiolipin". Biochemistry. 54 (36): 5569–77. doi:10.1021/acs.biochem.5b00540. PMID 26284624. ^ Herrmann JM, Woellhaf MW, Bonnefoy N (February 2013). "Control of protein synthesis in yeast mitochondria: the concept of translational activators". Biochimica et Biophysica Acta. 1833 (2): 286–94. doi:10.1016/j.bbamcr.2012.03.007. PMID 22450032. ^ Soto IC, Fontanesi F, Liu J, Barrientos A (June 2012). "Biogenesis and assembly of eukaryotic cytochrome c oxidase catalytic core". Biochimica et Biophysica Acta. 1817 (6): 883–97. doi:10.1016/j.bbabio.2011.09.005. PMC 3262112. PMID 21958598. ^ Aledo JC, Valverde H, Ruíz-Camacho M, Morilla I, López FD (October 2014). "Protein-protein interfaces from cytochrome c oxidase I evolve faster than nonbinding surfaces, yet negative selection is the driving force". Genome Biology and Evolution. 6 (11): 3064–76. doi:10.1093/gbe/evu240. PMC 4255772. PMID 25359921. ^ a b Leavesley HB, Li L, Prabhakaran K, Borowitz JL, Isom GE (January 2008). "Interaction of cyanide and nitric oxide with cytochrome c oxidase: implications for acute cyanide toxicity". Toxicological Sciences. 101 (1): 101–11. doi:10.1093/toxsci/kfm254. PMID 17906319. ^ Alonso JR, Cardellach F, López S, Casademont J, Miró O (September 2003). "Carbon monoxide specifically inhibits cytochrome c oxidase of human mitochondrial respiratory chain". Pharmacology & Toxicology. 93 (3): 142–6. doi:10.1034/j.1600-0773.2003.930306.x. PMID 12969439. ^ a b Nicholls P, Marshall DC, Cooper CE, Wilson MT (October 2013). "Sulfide inhibition of and metabolism by cytochrome c oxidase". Biochemical Society Transactions. 41 (5): 1312–6. doi:10.1042/BST20130070. PMID 24059525. ^ Roberts M, Reiss MJ, Monger G (2000). Advanced Biology. Nelson Thornes. ISBN 9780174387329. ^ Roberts MB (1986). Biology: A Functional Approach. Nelson Thornes. ISBN 9780174480198. ^ Jensen P, Wilson MT, Aasa R, Malmström BG (December 1984). "Cyanide inhibition of cytochrome c oxidase. A rapid-freeze e.p.r. investigation". The Biochemical Journal. 224 (3): 829–37. doi:10.1042/bj2240829. PMC 1144519. PMID 6098268. ^ a b c Gladwin MT, Shiva S (May 2009). "The ligand binding battle at cytochrome c oxidase: how NO regulates oxygen gradients in tissue". Circulation Research. 104 (10): 1136–8. doi:10.1161/CIRCRESAHA.109.198911. PMID 19461104. ^ Arnold S, Kadenbach B (October 1997). "Cell respiration s controlled by ATP, an allosteric inhibitor of cytochrome-c oxidase". Eur J Biochem. 249: 350–354. doi:10.1111/j.1432-1033.1997.t01-1-00350.x. ^ a b Sadacharan SK, Singh B, Bowes T, Gupta RS (November 2005). "Localization of mitochondrial DNA encoded cytochrome c oxidase subunits I and II in rat pancreatic zymogen granules and pituitary growth hormone granules". Histochemistry and Cell Biology. 124 (5): 409–21. doi:10.1007/s00418-005-0056-2. PMID 16133117. ^ Gupta RS, Ramachandra NB, Bowes T, Singh B (2008). "Unusual cellular disposition of the mitochondrial molecular chaperones Hsp60, Hsp70 and Hsp10". Novartis Foundation Symposium. 291: 59–68, discussion 69–73, 137–40. doi:10.1002/9780470754030.ch5. PMID 18575266. ^ a b Soltys BJ, Gupta RS (1999). "Mitochondrial proteins at unexpected cellular locations: export of proteins from mitochondria from an evolutionary perspective". International Review of Cytology. 194: 133–96. doi:10.1016/S0074-7696(08)62396-7. PMID 10494626. ^ Pecina P, Houstková H, Hansíková H, Zeman J, Houstek J (2004). "Genetic defects of cytochrome c oxidase assembly" (PDF). Physiological Research. 53 Suppl 1: S213–23. PMID 15119951. ^ Zee JM, Glerum DM (December 2006). "Defects in cytochrome oxidase assembly in humans: lessons from yeast". Biochemistry and Cell Biology. 84 (6): 859–69. doi:10.1139/o06-201. PMID 17215873. ^ Johar K, Priya A, Dhar S, Liu Q, Wong-Riley MT (November 2013). "Neuron-specific specificity protein 4 bigenomically regulates the transcription of all mitochondria- and nucleus-encoded cytochrome c oxidase subunit genes in neurons". Journal of Neurochemistry. 127 (4): 496–508. doi:10.1111/jnc.12433. PMC 3820366. PMID 24032355. ^ Wong-Riley MT (March 1989). "Cytochrome oxidase: an endogenous metabolic marker for neuronal activity". Trends in Neurosciences. 12 (3): 94–101. doi:10.1016/0166-2236(89)90165-3. PMID 2469224. ^ Hevner RF, Wong-Riley MT (November 1989). "Brain cytochrome oxidase: purification, antibody production, and immunohistochemical/histochemical correlations in the CNS". The Journal of Neuroscience. 9 (11): 3884–98. PMID 2555458. ^ Strazielle C, Hayzoun K, Derer M, Mariani J, Lalonde R (April 2006). "Regional brain variations of cytochrome oxidase activity in Relnrl-orl mutant mice". Journal of Neuroscience Research. 83 (5): 821–31. doi:10.1002/jnr.20772. PMID 16511878. ^ Strazielle C, Sturchler-Pierrat C, Staufenbiel M, Lalonde R (2003). "Regional brain cytochrome oxidase activity in beta-amyloid precursor protein transgenic mice with the Swedish mutation". Neuroscience. 118 (4): 1151–63. doi:10.1016/S0306-4522(03)00037-X. PMID 12732258. ^ Conejo NM, González-Pardo H, Gonzalez-Lima F, Arias JL (March 2010). "Spatial learning of the water maze: progression of brain circuits mapped with cytochrome oxidase histochemistry". Neurobiology of Learning and Memory. 93 (3): 362–71. doi:10.1016/j.nlm.2009.12.002. PMID 19969098.